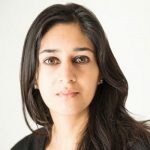 Ambika Behal is a former financial journalist; now the founder of startup app, Mytha, which combines education, mobile technology, and cultural art – with an emphasis on promoting sustainability, gender and empowerment issues. She is a writer for a variety of outlets, and a regular contributor for Forbes.com. Ambika has worked and resided in London, Hong Kong, New Delhi, and Washington DC. She is the author of Juggernaut's Honest Beauty, and has written a Lonely Planet Guidebook as well as a children's story for the literary NGO Pratham Books.